Mourners light candles to remember their loved ones. 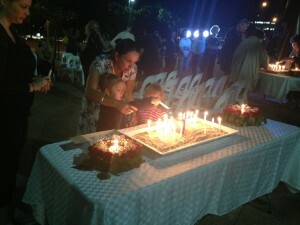 Eighteen empty chairs symbolising the 16 Queensland women and two children who lost their lives last year to domestic violence captured the attention of onlookers at a Kangaroo Point candlelight ceremony on Wednesday night. On the two smaller, wooden chairs sat two teddy bears. The event, with guest speakers, a choir and candle lighting, launched the National Domestic and Family Violence Prevention month. Ann Rob told her story of the struggle to protect her younger sister and two children, who were eventually killed in 2001 her abusive partner. “Fiona called a number of times during the following several years but unfortunately she would back out at the last minute,” she said. Sonia Anderson, whose daughter was killed in 2010 aged 22, talked of her daughter’s achievements and how she had now carried on her passion. “She was an advocate for young women who were subjected to violence,” she said. She urged the crowd to become involved in preventing abuse by “dobbing” in perpetrators and said social media could play a large part in prevention. “If you see it, I want you to speak up,” she said. Standing before a backdrop captioned “not one more”, Ms Anderson said: “I remember the day Bianca died. I remember saying I don’t want anyone else to ever be murdered. “I thought I’d make a difference on that day and my daughter was going to be the last person, in this country, ever to be murdered. But I watch the news and every day there’s a new one,” she said. Di Thompson, whose daughter was killed more than six years ago, said people stood by while she was assaulted and no one called the police. “We need to bring in legislation such as bystander’s laws,” she said. “We have to stop it being from a private matter- something behind closed doors. Domestic violence is murder.